Is there such a thing as too much blonde? Maxine Salon and Chicago Magazine’s 2012 Best Colorist, John Blue says “Yes.” In fact, he even has a name for them: Blonde-aholics. How would you define a Blonde-aholic? I would describe a blonde-aholic as someone who never feels they’re blonde enough, regardless of how light they actually are. Some clients always feel as if they could be lighter. These are the women who refuse to listen to their colorist’s professional suggestions that might involve softening the blonde and adding natural-looking lowlights or mid-tones to add dimension. Healthy blonde hair should reflect light and appear shiny, not dry and damaged as many blonde-aholic’s hair does. How would a Blonde-aholic know if they were going overboard with the blonde obsession? You know you’re a blonde-aholic when you find yourself booking a full foil highlight every four weeks, and not wanting any low-lights, or a gloss to tone it down. Who are the blonde-obsessed celebs? Christina Aguilera is a perfect example of a true blonde-aholic. Her hair most times, appears to be dry, damaged and even crunchy looking. Healthy blonde hair should reflect light and appear shiny. When it’s dull and damaged, it appears that way, regardless of how much shine hair product you use in it. Proper treatment depends on the type of blonde-aholic – if you’re a double process blonde, consider getting a touch up every four weeks and get a good trim each time to eliminate any “chewy” looking ends. For an overly highlighted blonde-aholics, consider low-lights, leaving the natural base color as-is, and possibly adding a deeper golden or wheat toning gloss to seal the cuticle and add shine. As you see below, my model Danielle was overly-processed and lacked depth. She was once a double process blonde and transitioned into bleach foils. Her hair appeared damaged, lacked tonality and didn’t compliment her skin tone. To fix up Danielle, I created depth at the root by applying a semi permanent color throughout the crown. 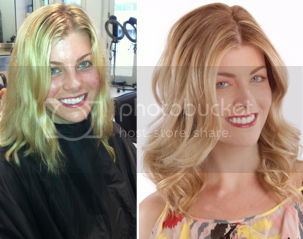 We also decided to transition Danielle into a softer look by balayaging subtle highlights throughout with golden-toffee lowlights to create dimension and movement. At the end, we applied a richer, golden wheat glaze to bring warmth and shine, creating the appearance of a healthy, buttery blonde. For all the blondes out there, what category do you fall into!? Come to Maxine Salon for a diagnosis! Maxine, the Chicago Flagship L’Oréal Professionnel Haircolor Center, offers expert haircutting, styling, and the latest color techniques. These services – delivered by cutting-edge, accessible stylists and colorists, along with premium customer service–make Maxine a most coveted beauty destination. The luxury professional hair care lines Kérastase and Shu Uemura Art of Hair are available. Maxine is open Monday through Saturday with evening hours. Valet parking is available. • “Keep it simple with barrettes and ‘mini-do’s’. ‘Mini-do’s’ are an easy way to style your hair with minimal effort while maintaining an organic shape. Back-combing, a little bit of hairspray and mini bun or a few pin curls keep hair intact. For a complimentary consultation or to make an appointment with Dani, clients can call 312.751.1511.